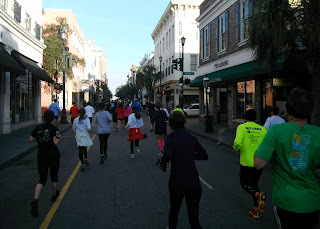 For the past two years I have run the Charleston Marathon (mostly because I wanted to support a local race) and both years I wrote reviews that were, well, not so great. This year was NOT the same. This year I knew that those people were thinking the same thing as me. First, the expo was at Burke High School in downtown Charleston. It was easy to find, had plenty of parking and was well organized (plus, it had plenty of helpful volunteers). 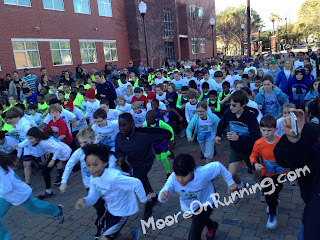 Second, the Kids Marathon was awesome. 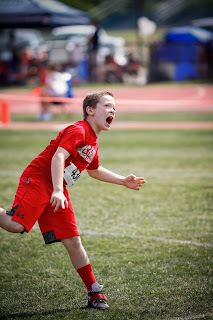 My nine year old son ran the race with one of his buddies and they had a blast. 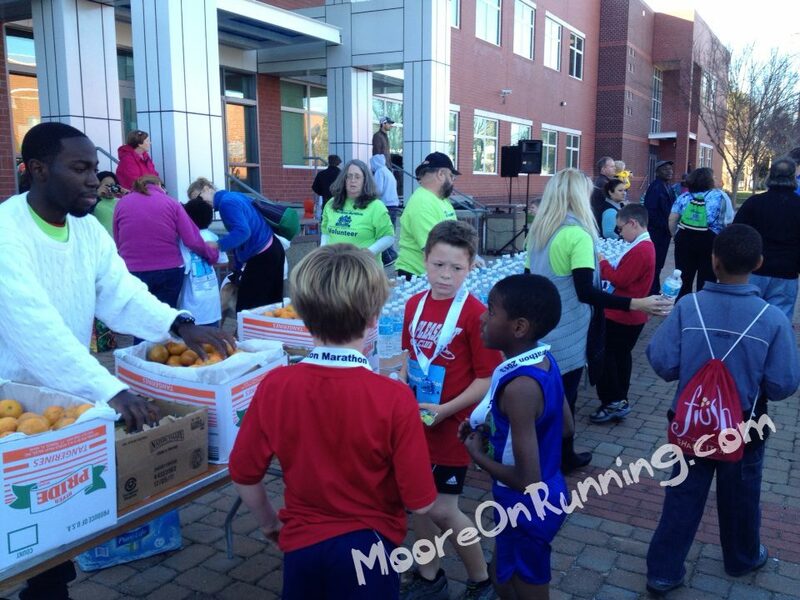 I love that they had water and food tables just like any other race. The medals were great and the volunteers rocked (plus it was free!). A few things before I get to the start. 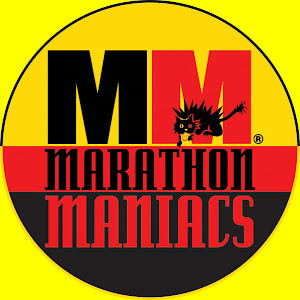 This was my ninth marathon and my second time pacing a race (last year I paced the half marathon). This year my running partner CSR and I were the TrySports pace leaders for the five hour marathon group. My disclaimer about the title: I have lived in Charleston for over eighteen years so I now consider myself a local, but not a Charlestonian (believe me, there is a difference and a Charlestonian will let you know that difference in a very polite southern way). 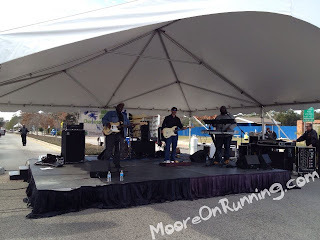 The morning of the race was a little cold, but we were able to stand inside Burke High School until the start. There were plenty of restrooms inside the school and port-a-lets at the starting line. The race started on Lockwood Blvd near Joe Riley Stadium. 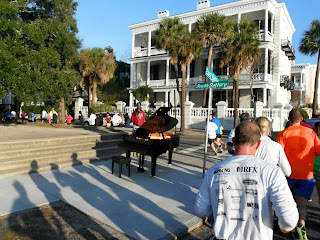 There were over 4,000 runners for all the races (half, full and 5k), but it still had that small town feel. The route this year was much improved. Props go out to Howie Schomer for all his work. He spent countless hours mapping routes that would work and, in my opinion, hit a home run with this one! The first few miles of the race are absolutely beautiful. Runners go down Lockwood Blvd and then around the Charleston Battery. From there runners turned up King Street. 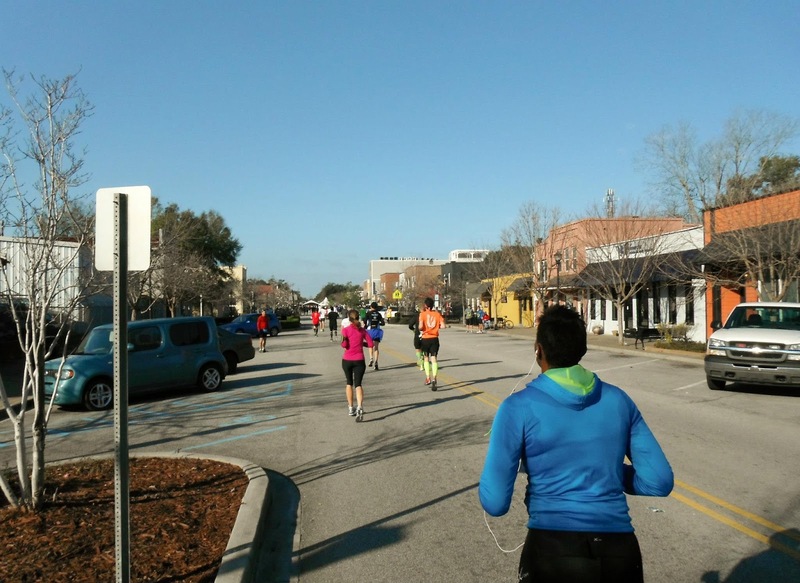 The route on King Street is several miles and goes through some of the most beautiful parts of the city. It also goes through areas that have recently been revitalized and look amazing. This same street tuns into some industrial areas as it moves the runners toward North Charleston. 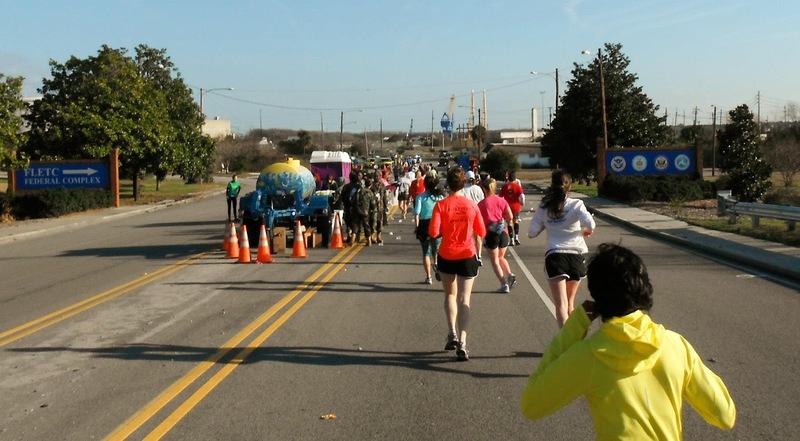 At mile ten, the half marathoners split off to the right and headed toward the old Navy base and then to the finish. At this same point the full marathon runners took a left and headed out for an out and back section. I will tell you that I was a little apprehensive about this section. 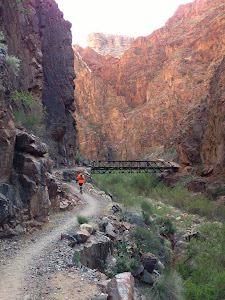 The old route had an out and back that I called the "Charleston Death March". 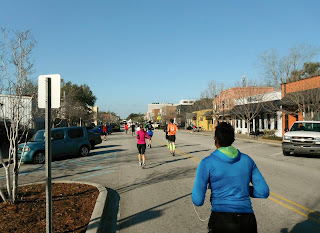 I was pleasantly surprised to see that we were going down Tidewater Road and heading to the Cooper River Marina. 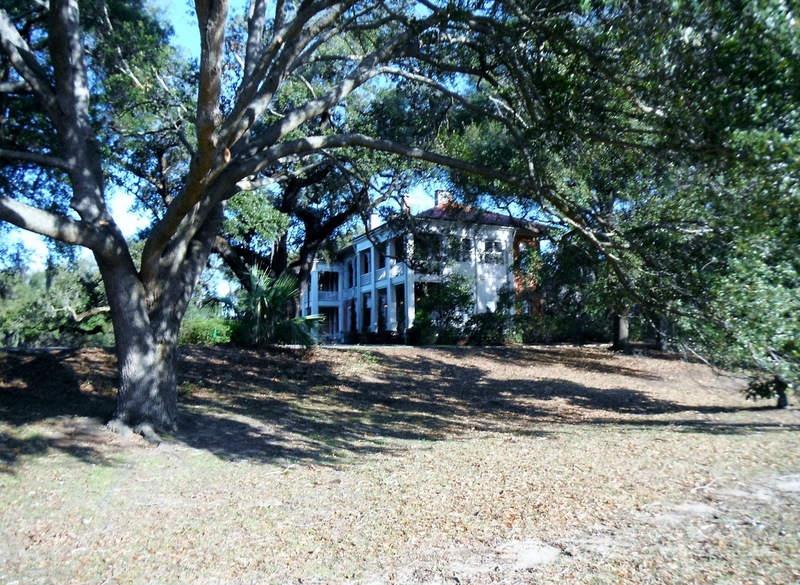 There were views of the Cooper River, Shipyard Creek, marsh, and old oak trees. The coolest thing was that the turnaround point was on the pier of the Cooper River Marina. As you run down the pier you get an amazing view of the Cooper River and the Arthur Ravenel Bridge (Cooper River Bridge to us locals)! 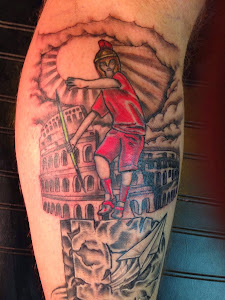 I usually hate out and backs, but this one was awesome. One suggestion, I would add a water stop somewhere in the middle of this section (just a minor suggestion). The route then goes up North Hobson Avenue for miles 15 and 16. Some people may not like this area, but I think it is so cool. 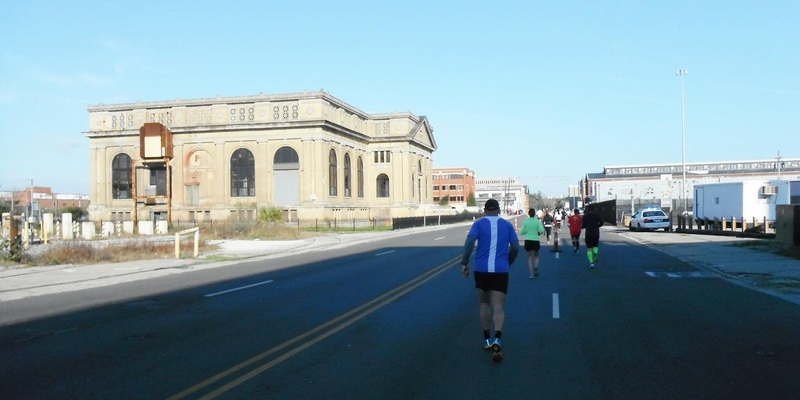 You get to run through the old Charleston Navy Base and right by a really neat building. Not sure exactly what its for now, but it has "Power House" on the front and it just looks cool. 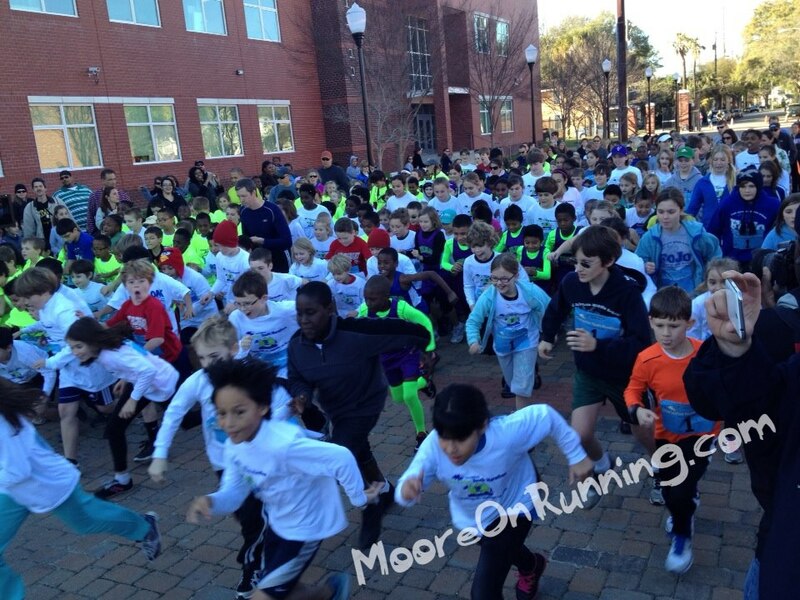 The route takes runners through Park Circle and then past the Academic Magnet School. 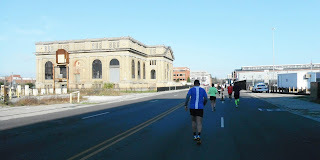 Some of this area is not the nicest, but there were a lot of people cheering us on as we went by. This is also the area with the most twists and turns and even some short out and backs. Still, the route is really nice and much improved from years past. 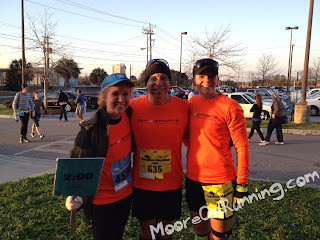 Here is where I think the Charleston Marathon really pulled it all together. At mile 24 the route actually has a little downhill to it and leads the runners back to the old Navy base and to the Noisette Park. 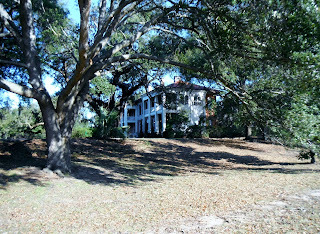 This is a beautiful area with views of the Cooper River, moss covered trees and huge old houses on the old base. From the park the route goes up a short distance and turns left onto Montague Ave or Old North Charleston. This area has been revitalized and is a perfect place for the end of the race. The finish line ends right in front of North Charleston High School where volunteers were there to hand out medals. Just a few steps from the finish line was a band playing and what looked like a huge street party. 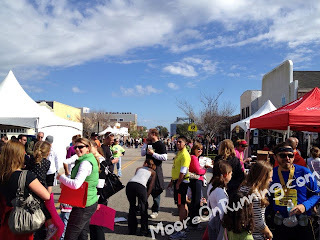 The street was shut down and there were tents with beer and shrimp & grits (a staple in Charleston). I walked around for a while and heard some inspiring stories of first time finishers, PR's and fellow pacers getting people to the finish line. 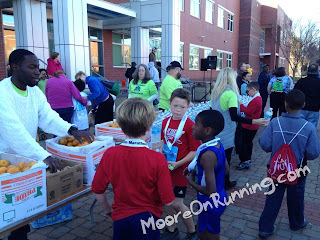 Some final thoughts: There were plenty of cups at all the aid stations. There was gel at several aid stations from mile 12 to 24 (nice touch). There were plenty of volunteers to direct the runners (the half marathon split confused some people, but that happens all the time). I liked that there were bananas, pretzels, and cola at some of the aid stations (you usually only see that at Ultras) I saw plenty of medics on bikes and at aid stations throughout the course. There were plenty of buses to take people back to the start. Finally, I thought it was a really cool that if you wanted to take a shower after the end of the race you could go right into the high school locker rooms! 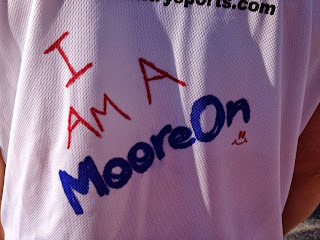 So I walked away from the race feeling pretty good and very proud that my town can put on such a great Marathon.